The following is a report of the game held over two meetings - July and August 2002. Captain Luigi Correlli woke as the sun lit up his canvas tent, it was hot like usual, it was damp and humid as normal, yes it was just another normal usual day in the hell of North East Africa. Correlli rubbed the sleep from his eyes and focused on the day ahead, there was that bloody pontoon to put across the river below the drift, followed by a mealie bean and biscuit lunch, followed by more work on the pontoon and an evening mealie and biscuit dinner. All in the name of Empire. The new Italian thrust into the African hinterland was paying dividends, driving in to the very North East corners of the Congo and competing with the Germans, British and Belgians was seeing national pride back home soaring. It was a good time to be an Italian, God was an Italian. Luigi’s batman appeared to help him into his boots and to ready his shaving kit. Luigi poised there was shouting on the out skirts of the camp, razor in hand he strode out. A horseman had appeared who gestured westwards and then galloped off east towards the coast. A soldier ran up to him, “Sir, he says the forward column has been destroyed by the regiments of Chief Jenkenswayo”. Luigi did not believe it there were too many men in the column to be destroyed by the great Uluz Tribe. However as the minutes drew on a trickle of others appeared at the run sweeping past the Drift and heading east. Luigi knew something terrible had occurred and that a greater threat than the monotony of an African day was heading his way. Luigi knew his present position was weak but what were the choices, they could not out run the Uluz especially with the wounded and what of the home base if they did ? Luigi knew he had too stand and fight and quickly put his 120 regulars and 150 native volunteers to work. The large numbers of mealie bags and biscuit boxes were thrown up to make connecting barriers to the few stone walls and the drift’s main kraal. He considered taking in the larger kraal to the North but his men were clearly not enough to man such an expanse. The work was barely completed before the look outs ran in shouting that a huge cloud of Uluz were on the way. In the distance it sounded as if a train was departing Rome Station. Luigi hurried his men into position and despaired as he saw large numbers of figures appearing on the heights to the West. It was at this point that his native volunteers broke and fled to the North. From the South a huge column snaked around the drift and started to attack from the North and East. It was clear that two regiments were involved the Buffalo ’s and the Rhino led by theirs colonels Hunta and Jonka. These attacked in Force but were beaten back with heavy loss by the meagre garrison that suffered not one man killed or wounded. Luigi looked at his watch, an hour had passed. For the next hour only sniping took place from the heights and the men on the west wall had to be pulled in after suffering several losses. 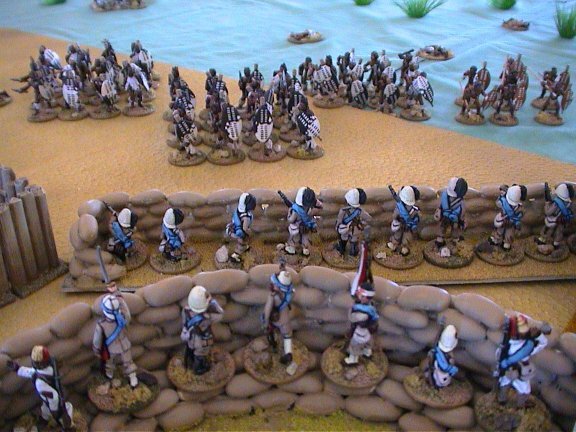 The Uluz were massing again and this time a third regiment had appeared, the Lions led by Jeffrezi. Again the attack was made from the North and East. This time Dikka a minor Chief led part of the Buffalo ’s into the small kraal only to be beaten back. 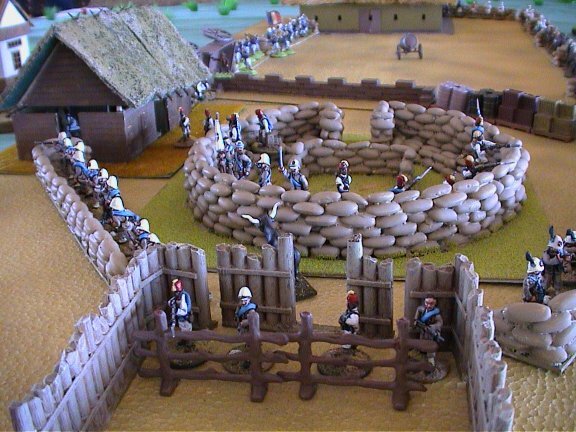 A weakness had been made and the Lions attacked they stormed through the Kraal and up to the mealie bag redoubt and then trickled over that before they were beaten back. The Rhino’s attacked but eventually all were beaten back. The west wall again came under fire with more losses inflicted. Luigi reorganized his men, five hours had passed and heavy losses had been inflicted on his small command. There was no respite this time the Lions attacked from the South and the others from the North and East. The Lions again proved their courage almost taking the hospital and setting fire to the store by the end of their attack their bodies littered the compound. Again the Buffalo ’s and Rhino’s were beaten back with heavy losses and Chief Dikka was crying with frustration at the failure of his companies. To the Rhino’s their losses were aggravated by the death of Jonka and command passed to Chief Criz. Luigi took stock, 65 of his men were dead or wounded, he could no longer hold the entire drift and so he abandoned the hospital which had already proved to be a weak link. 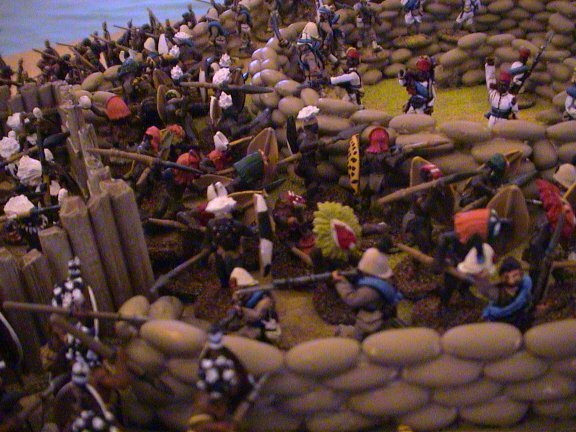 The seriously infirm were carried to the mealie redoubt, which had been strengthened. The bigger compound was abandoned. Little now took place and for the next two hours the Uluz licked their wounds. Then again they attacked and for once Luigi was glad the thatch of the store was burning. Again the attack was beaten off. As deep night fell it was clear that the Uluz had massed to the West and were attacking along the walls of the compound, which offered some cover. It was also clear that the Lions were spent and many warriors fell to the ground with exertion. The attack went in and all seemed hopeless but against all odds Luigi held and the Rhino’s and Buffalo ’s were driven off. With a final roar Jeffrezi led his Lions forward and his tired warriors lifted themselves from the ground only to die before the redoubt. Twelve hours of fighting had taken place and Luigi only had 40 men left alive. They fell to the ground from thirst and exhaustion and waited for dawn. When dawn came the hills to the west were covered by Uluz warriors, the end had come. Luigi knew his men could take no more but then an incredible thing happened the Uluz let out a great chant and then turned and left. So our refight of Rorkes Drift over two meetings with a hotch potch of colonial figures had ended. We had used Heart of Africa Rules with the modification of Uluz Move, Italian Fire, Italian Move, Italian Fire, i.e. the Italian fire had been doubled. Each Uluz regiment had been split into sub-units and when two thirds of these had lost a morale throw the regiment fell back and regrouped. There were some 450 ‘Uluz” on the table and these numbers returned on each regrouping. It was a near run thing and much of the true fighting had been randomly recreated. I had designed the game for 12 moves of 1 hour with the attacks to be carried out written on cards drawn from a deck. The Uluz had nearly taken the hospital and had burned the store. They had streamed across the garden and outer kraal and had taken the little but stronger kraal on two occasions. The Uluz suffered 550 dead against a true recorded figure of 750 Zulus, the Italians had lost two thirds of the garrison a much greater loss than actually occurred to the British. The Italians could not have withstood another attack but the Zulu had already had one third reach tiredness and a high likelihood existed that all three regiments had reached near exhaustion. It was "A NEAR RUN THING”.